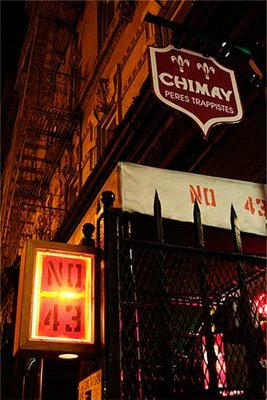 Reviews, Reading Series, TYPO News, etc. The pineal gland is an organ in the brain said to be the seat of insight, spirit, intuition, the mystic’s ‘house of the third eye.’ Sadly it is also said to calcify over time. Various strategies are suggested to open the pineal gland, to strengthen and purify this mysterious center of the mind. Rituals may entail various breathing practices, meditation, and a variety of other methods all purported to promote a cleansing of this sacred gland and open intuitive channels. Nowhere have I read that poetry, either in reading, listening nor writing is a pathway to opening the pineal gland as means of spiritual purification, but surely, upon reading Katherine Jesme’s The Plume-Stone Game, this book should be added to the list of detoxification options for promoting good psychic health. Jesme’s The Plume-Stone Game is a glass of soothed milk, placed to the reader’s lips, which once swallowed opens into the wonder of that ‘other world’ as a light both dividing the two hemispheres of the brain and simultaneously bridging the functions of the mind and the body: “She is like an animal, all desire—without language to staunch it//but she can’t tell that her kind are different…” Kathleen Jesme lays out the content of darkness, and will not go away into dark. The book settles into four sections, but this is an understatement. The book swings as if through a revolving door, examining the three dimensional hologram of the lung’s interior chambers where, from a deeply dealt breath, a voices rises into the language of a fierce and distant new country. The sections unfold, archeologically, as if detailing the examinations of consciousness from the dirt inscribed under the fingernails, into the umbel blossoming of a multi-layered landscape. “Shall we examine betrayal? The small lesions on the skin that begin as ordinary…” Nothing in The Plum-Stone Game is ordinary. A reader is left to follow a pocket watch to which time will not be obedient. The hours, a relentless beauty, page after page, begin in the prose of saints, moving through sinuous lyric, cataloging the relics of a found ethnography and returning again to prose. Her movements are subtle, sparse, languid, as startling as the arrival of desert songbirds, pallid in the snow sun, those whose messages are carried alone through red hibiscus. Into the ear, the intimate distance of stars, sawdust, flecked notes. Reader, as you move thorough The Plum-Stone Game, perhaps you will be reminded of an ancient self, what has been lost to you may return, as an exhibit, a shattered teacup glued back together. Jesme explores the synthesis of a dual body: “opens her mouth and feels my throat…” where the throat of my throat is swallowed deep into the limit of what eternal wild awakening, limitless and needle-sharp. If you would like to submit a review or send a review copy query Matthew Henriksen at matt@typomag.com. Farrah Field’s first book of poems, Rising, won Four Way Books’ 2007 Levis Prize. Her poems have appeared in many publications including the Mississippi Review, Margie, The Massachusetts Review, Pool, Typo, Harp & Altar, 42Opus, La Petite Zine, Sojourn, Pebble Lake Review, Another Chicago Magazine, Fulcrum, and The Pinch. She lives in Brooklyn and blogs at adultish.blogspot.com. Jared White was born in Boston, and has lived in Brooklyn for about eight years, during which time he received an MFA in poetry from Columbia, as well as playing a fair amount of music, mostly on the piano. His poems have appeared journals in print (Another Chicago Magazine, Barrow Street, Cannibal, Fulcrum) and online journals (Coconut, Horse Less Review, Word For / Word, Verse). He also published essays on poetry and music, most recently in Harp & Altar, Open Letters, and Poets Off Poetry. He was awarded a University Writing Prize from the Academy of American Poets. A chapbook of poems, entitled Yellowcake, was in Cannibal Books' Narwhal compendium. His very occasional blog, No No Yes No Yes, can be found at jaredswhite.blogspot.com. 3996 Frontage Road #2 is just off the intersection of Joyce and College. Heading North on College, turn RIGHT on Joyce (heading East), then LEFT (North) on the access road (which is the first road to the left). It is the first building on the Right – red awnings. Faces the access road, but abuts Joyce. It is across Joyce from the Bank of America. The access road heads toward the back of Barnes and Noble, not south toward Panera. Handmade & other books available at a discount, w/ refreshments, gallery tours, & social hour following the reading. Cannibal Books publishes hand-sewn literary journals and chapbooks which focus on divergent and emerging poetics. While our products fit into the category of book arts, the focus is entirely on presenting daring work from a broad range of styles. An aesthetic definition cannot define the hunger. Founded in Brooklyn, NY in 2004, Cannibal Books currently nests in Fayetteville, AR. Visit flesheatingpoems.blogspot.com or query flesheatingpoems AT gmail DOT com. Carolyn Guinzio is the author of Untitled Wave from Cannibal Books, Quarry (Parlor Press) and West Pullman (Bordighera). Her work has appeared in many journals including Blackbird, Colorado Review, and New American Writing. She lives in Fayetteville, Arkansas. Read two poems in Typo. Kevin Holden is the author of Identity from Cannibal Books. His poems have appeared or are forthcoming in such journals as Colorado Review, Ecopoetics, The Harvard Advocate, The Liberal, Parcel and Typo. He is from Rhode Island and lives and teaches in Iowa. Read an excerpt from Identity in Typo. MC Hyland is the author of four chapbooks: Residential As In (Blue Hour Press, 2009), The Hesitations (a collaboration with Friedrich Kerksieck and Kate Lorenz, Small Fires Press, 2006), Incantations (reject sheep press, 2006), and Lost Gospels (Ponkapoag Press, 2005). She currently lives in Minneapolis, where she teaches creative writing and letterpress through local nonprofits, and runs DoubleCross Press. Keith Newton’s chapbook Sent Forth to Die in a Happy City was published this winter by Cannibal Books. His poems and translations have appeared recently in Harvard Review, Saltgrass, and Open Letters. He lives in Brooklyn, where edits the online magazine Harp & Altar. Read “Materialization in a Black Sea” in Typo. kathryn l. pringle is the author of Right New Biology, just out from Factory School/Heretical Text Series. She is the author of The Stills (Duration Press) and Temper & Felicity are Lovers (TAXT). She is an editor at the literary magazine minor/american, and the co-founder of the minor american reading series. She currently lives in Durham, North Carolina. Read The Stills at Duration Press (requires Adobe Acrobat). Amish Trivedi’s electronic chapbooks include Selections from Episode III (Beard of Bees), The Ink Sessions (Scantily Clad), and The Breakers (Absent Magazine). His poems appear in La Petite Zine, Cannibal, Word For/Word, and Backwards City Review. He lives in Iowa City. Read The Ink Sessions at Scantily Clad Press. Joseph P. Wood’s first full book of poems, I & We, will be published by CustomWords in 2010. He is also the author of two chapbooks: Travel Writing (Scantily Clad Press) and In What I Have Done & What I Have Failed to Do (Elixir Press). He lives in Tuscaloosa, Alabama. Read “Anatomy of a Bullet Wound” in Typo. Carrie Olivia Adams, author of Intervening Absence, works in publishing in Chicago, where she is also Poetry Editor for Black Ocean. Her poems and criticism have appeared in such journals as DIAGRAM, Cranky, Lilies and Cannonballs, No Tell Motel, Backwards City Review, and Verse. She is also the author of the chapbook A Useless Window. Ben Doller (né Doyle) is author of FAQ: from Ahsahta Press. His first book of poems, Radio, Radio, was selected by Susan Howe as winner of the 2000 Walt Whitman Award from the Academy of American Poets. He has taught in West Virginia, Iowa, Ohio, and California. Wherever he lives, he lives with his wife, Sandra Doller (née Miller) and their boxador, Ronald Johnson. Kathleen Jesme is the author of The Plum-Stone Game, published by Ahsahta Press this month. She has written two previous collections of poetry: Motherhouse, winner of the Lena-Miles Wever Todd Poetry Prize, and Fire Eater. She lives in Minnesota. Forrest Gander is the author of numerous books of poetry, including Eye Against Eye, Torn Awake, and Science & Steepleflower, all from New Directions, Gander also writes novels (As a Friend), essays (A Faithful Existence) and translates. His most recent translations are Firefly Under the Tongue: Selected Poems of Coral Bracho, No Shelter: Selected Poems of Pura Lopez-Colome, and, with Kent Johnson, two books by the Bolivian wunderkind Jaime Saenz: The Night and Immanent Visitor: Selected Poems of Jaime Saenz. With poet C.D. Wright, Gander lives in Rhode Island, where he is Professor of English and Comparative Literature at Brown University. Matt Hart is the Editor-in-Chief of Forklift, Ohio and the author of Who's Who Vivid (Slope Editions) and three chapbooks: Revelated (Hollyridge Press), Sonnet (H_NGM_N Books) and Simply Rocket (Lame House Press). His work has appeared in many print and online journals, including Gulf Coast, H_NGM_N, Jubilat, and Octopus. He is, as always, still trying to find a way to get Polyphemus, Todd Rundgren and Haruki Murakami into his bio permanently. Travel is his rock band. Brenda Hillman’s seven collections of poetry—White Dress, Fortress, Death Tractates, Bright Existence, Loose Sugar and Cascadia, Pieces of Air in the Epic (2005)—are from Wesleyan University Press; she has also written three chapbooks: Coffee, 3 A.M. (Penumbra Press), Autumn Sojourn (Em Press), and The Firecage (a+bend press). Hillman has edited an edition of Emily Dickinson’s poetry for Shambhala Publications and, with Patricia Dienstfrey, has co-edited The Grand Permisson: New Writings on Poetics and Motherhood (2003). A recipient of numerous awards, Hillman has received fellowships from the National Endowment for the Arts and the Guggenheim Foundation, among others. She resides in the San Francisco Bay Area; she is married and has a daughter. Alex Lemon is the author of the poetry collections Hallelujah Blackout (Milkweed Editions), Mosquito (Tin House Books 2006), At Last Unfolding Congo (horse less press) and the memoir Happy (Scribner 2010). A play will be published by cinematheque press in 2010. His poems have appeared in numerous magazines, including Esquire, Best American Poetry 2008, AGNI, BOMB, Gulf Coast, jubilat, Kenyon Review, New England Review, Open City, Pleiades and Tin House. He was awarded a 2005 Literature Fellowship in Poetry from the National Endowment for the Arts and a 2006 Minnesota Arts Board Grant. He co-edits LUNA: A Journal of Poetry and Translation with Ray Gonzalez and is a frequent contributor to The Bloomsbury Review. Barbara Maloutas is the author of the Whole Marie, winner of the 2008 Sawtooth Poetry Prize, selected by C.D. Wright. Her previous books include In a Combination of Practices (New Issues, 2004) and Practices (New Michigan Press/Diagram, 2003). In 2007 Beard of Bees (Chicago) published an online chapbook, Coffee Hazilly; Segue published a series of poems and an essay on writing them. She teaches book structures and book arts at Otis College of Art and Design in Los Angeles. Rusty Morrison’s the true keeps calm biding its story won the 2008 James Laughlin Award from the Academy of American Poets, selected by Rae Armantrout, Claudia Rankine, and Bruce Smith. It also won The Ahsahta Press 2007 Sawtooth Poetry Prize, selected by Peter Gizzi, and the 2007 Poetry Society of America’s Alice Fay Di Castagnola Award, selected by Susan Howe. Rusty Morrison’s first poetry collection, Whethering, won the Colorado Prize for Poetry (Center for Literary Publishing 2004), selected by Forrest Gander. She is a contributing editor for Poetry Flash and co-publisher of Omnidawn. A veteran of the slam-poetry scene, G.E. Patterson was a featured poet-performer in New York’s Panasonic Village Jazz Fest. He is also the author of two poetry collections, Tug (Graywolf Press) and To and From (Ahsahta Press). His writing can be found in several magazines and anthologies, including Blues Poetry, Bum Rush the Page: A Def Poetry Jam, Poetry 180, Isn’t It Romantic, American Letters and Commentary, nocturnes: (re)view of the arts, Open City, Provincetown Arts, Seneca Review, Swerve, Xcp: Cross Cultural Poetics, and St. Mark’s Poetry Project’s Poets and Poems. After living for several years in the Northeast and on the West Coast, G.E. Patterson now makes his home in Minnesota, where he teaches. Marvyn Petrucci is the author of Pardon Me, Madam from Cannibal Books. His poems have appeared in Typo, Black Warrior Review, The Connecticut Review, Natural Bridge, Southern Humanities Review and Third Coast. He teaches English at Auburn University. 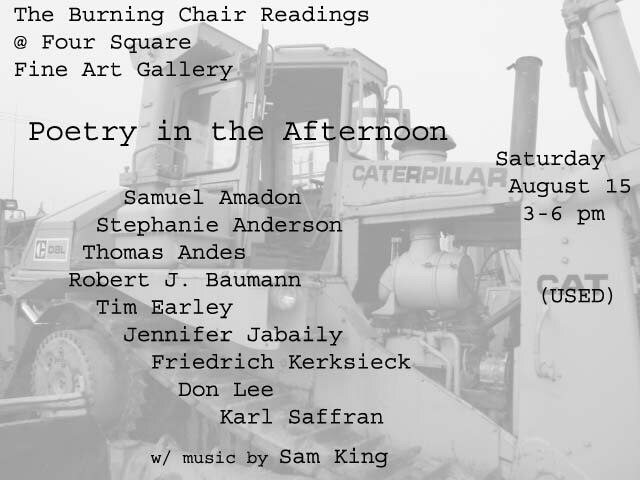 The Burning Chair Readings began in the East Village of New York City and Brooklyn in 2004 and ran regularly for four years until setting up shop in Fayetteville, Arkansas in 2008. The Burning Chair orchestrated the Fran Stanford Literary Festival in Fayetteville in October 2008 and have plans in the works for future festivals focusing on alternative and southern literature as well as independent publishing and book arts. Ahsahta Press was founded in 1974 at Boise State University; in 2000, Janet Holmes was named director and editor. The press seeks out poetry with an innovative twist and the kind of attention to language that pushes beyond craft into art; it produces books whose design takes on these high standards as well. The name "Ahsahta" comes from the Mandan word for a Rocky Mountain bighorn sheep, and was first recorded by the Lewis and Clark expedition in Idaho. Typo was founded in Fayetteville, Arkansas by Adam Clay and Matthew Henriksen in 2002. The online-only poetry magazine, which publishes established and emerging poets, is available at typomag.com. Readings, panels, and a film screening. We're also a group on Facebook. Ana Božičević moved to NYC from Croatia in 1997. She’s the author of chapbooks Document (Octopus Books, 2007) and Morning News (Kitchen Press, 2006). Look for her recent work in Denver Quarterly, Saltgrass, Hotel Amerika, absent, The New York Quarterly, Bat City Review, MiPOesias, Octopus Magazine and The Portable Boog Reader 2: An Anthology of NYC Poetry. Ana co-edits RealPoetik. John Coletti is the author of The New Normalcy (BoogLit 2002), Physical Kind (Yo-Yo-Labs 2005), and Street Debris (Fell Swoop 2005), a collaboration with poet Greg Fuchs with whom he also co-edits Open 24 Hours Press. He currently is the editor of The Poetry Project Newsletter. 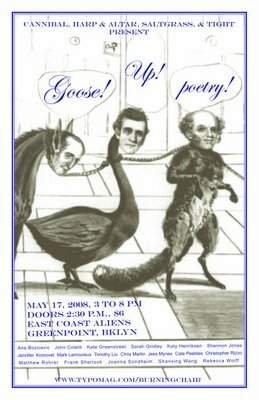 Kate Greenstreet is the author of case sensitive (Ahsahta Press, 2006) and three chapbooks, Learning the Language (Etherdome Press, 2005), Rushes (above/ground press, 2007), and This is why I hurt you (Lame House Press, April 2008). Her second book, The Last 4 Things, will be out from Ahsahta in 2009. Her poems can be found in journals like Cannibal, Fascicle, and Handsome. New work is forthcoming in Filling Station, Practice, and The Columbia Review. Sarah Gridley is Poet in Residence and a Lecturer in Creative Writing at Case Western Reserve University. She received an MFA in poetry from the University of Montana in 2000, where she was a Richard Hugo scholar and won the 1999 Merriam Frontier Award for excellence in creative writing. The University of California Press published her book Weather Eye Open in 2005. She has recently completed a new poetry manuscript, whose poems have appeared or are forthcoming in Fourteen Hills, NEO, Harp & Altar, Crazy Horse, jubilat, Denver Quarterly, New American Writing, and Chicago Review. Katy Henriksen was born and raised in the Arkansas Ozarks. She is the design editor of the poetry journal Cannibal, which she creates with her husband Matt Henriksen in their tiny railroad apartment in Greenpoint, Brooklyn. She also helps run The Burning Chair Readings. Her music and culture writing may be found in Venus Zine, The Brooklyn Rail, Paste, Publishers Weekly, Puremusic.com, Rust Buckle, and elsewhere. Four of her poems are forthcoming in Tight. Shannon Jonas is the author of Compathy (Cannibal Books, 2007) and lives in Kalamazoo, Michigan. Jennifer Kronovet is the author of Awayward (BOA Editions, 2009), selected by Jean Valentine as the winner of the Poulin Prize. Kronovet is the co-founder and co-editor of CIRCUMFERENCE, a journal of poetry in translation. Her poems have appeared or are forthcoming in Colorado Review, Harp & Altar, Ploughshares, A Public Space, and other journals. She was born and raised in New York City, and has lived in Chicago, St. Louis, and Beijing. Mark Lamoureux is a poet, critic and translator who lives in Astoria, NY. His work has appeared in numerous publications, both in print and online. He is an associate editor for Fulcrum Annual. He is the author of three chapbooks: City/Temple (Ugly Duckling Presse, 2003), 29 Cheeseburgers (Pressed Wafer, 2004) and Film Poems (Katalanche Press, 2005). Timothy Liu is the author of six books of poems, most recently For Dust Thou Art. Two new books are forthcoming, Bending the Mind Around the Dream's Blown Fuse (Talisman House, 2008) and Polytheogamy (Saturnalia Press, 2009). His journals and papers are archived in the Berg Collection at the New York Public Library. Liu is currently an Associate Professor at William Paterson University and on the Core Faculty at Bennington College’s Writing Seminars; he lives in Manhattan. Chris Martin is the author of American Music. His new book, Becoming Weather, is trying to become published. 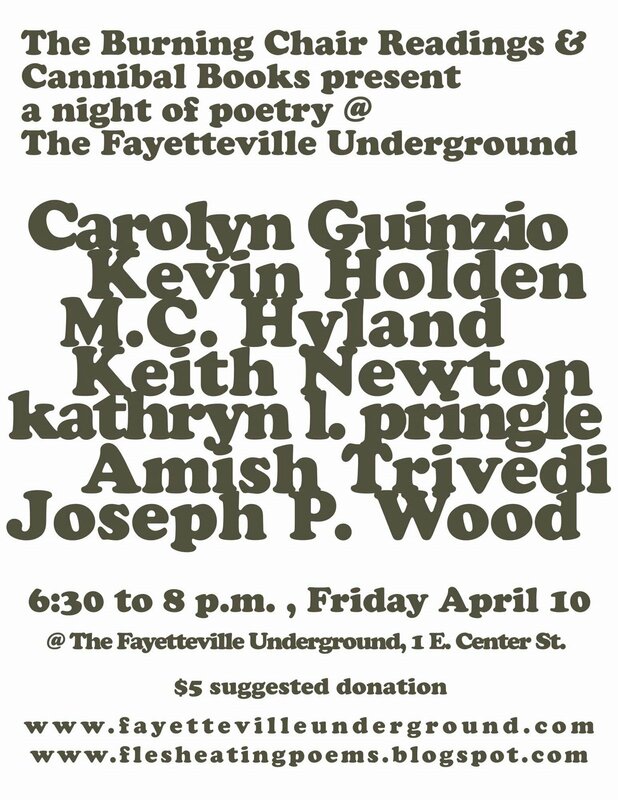 His newer book, On Song, is an ongoing investigation of song’s ontological use from the Caveman Days until Tonight. He is the editor of Puppy Flowers, an online magazine of the arts, and resides near the Prospect Park Zoo with a beautiful lady and her cat. Jess Mynes is the author of Birds for Example, Coltsfoot Insularity (a collaboration with Aaron Tieger), In(ex)teriors, and Full on Jabber (a collaboration with Christopher Rizzo). He is the editor of Fewer & Further Press. In 2008, his If and When (Katalanche Press), Sky Brightly Picked (Skysill Press), Recently Clouds, and a second edition of In(ex)teriors (Anchorite Press) will be published. He lives in Wendell, MA where he co curates a reading series, All Small Caps. His poems have appeared in numerous publications. Cate Peebles lives in Brooklyn and works at the literary agency, Sobel Weber Associates, in Manhattan. Her poems have appeared in, or are forthcoming from, Tin House, Octopus, La Petite Zine, MiPOesias, Capgun, and others. She co-edits the on-line poetry magazine, Fou. Christopher Rizzo is a writer and publisher who lives in New York. Over the years, his work has appeared in Art New England, The Cultural Society, Cannibal, Dusie, H_NGM_N, and Spell among other magazines. Christopher has also authored several chapbooks, such as Claire Obscure (Katalanche Press, 2005), Zing (Carve Editions, 2006), and The Breaks (Fewer & Further Press, 2006). 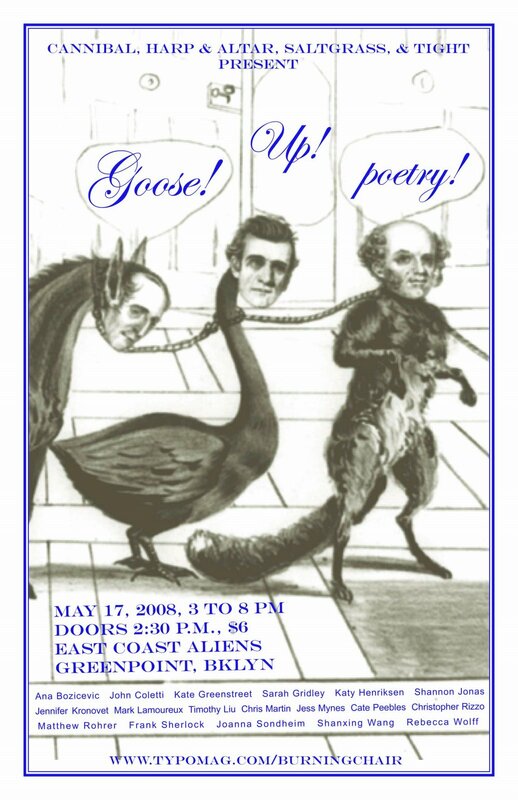 Full on Jabber, a collaborative work written with poet Jess Mynes, was released by Martian Press in 2007. Christopher also edits Anchorite Press, an independent poetry publisher of innovative work. He is a doctoral candidate in English at the University at Albany. Matthew Rohrer is the author of five books of poetry, most recently RISE UP, published by Wave Books. He teaches in the creative writing program at NYU and lives in Brooklyn. Frank Sherlock is the co-author of the newly released Ready-to-Eat Individual with Brett Evans. Joanna Sondheim’s chapbooks, The Fit and Thaumatrope, were published by Sona Books in 2004 and 2007, respectively. Recent work appears in Unsaid magazine. Shanxing Wang was born in Jinzhong, Shanxi province, China, in 1965. He moved to the U.S. in 1991 to pursue a PhD in mechanical engineering at University of California at Berkeley. While an assistant professor of engineering at Rutgers University, he began taking writing courses at Rutgers and later the Poetry Project, and subsequently received a Zora Neale Hurston Scholarship to attend the summer writing program at Naropa University in Colorado in 2003. His first book Mad Science in Imperial City (Futurepoem Books, 2005) won the 2006 Asian American Literary Award for Poetry. His current thinking and struggling focuses on intersections of poetry/poetics with physics/mathematics, history, visual arts, and continental philosophy. He is also a competitive table tennis player and a table tennis coach. He lives and writes in Queens and he has a blog: shanxingwang.blogspot.com. Rebecca Wolff is the author of Manderley, Figment, and The King (forthcoming 2009). She is the publisher and editor of Fence, Fence Books, and The Constant Critic, and is a fellow of the New York State Writers Institute, with which Fence is affiliated. She lives in Athens, New York. poems about the river go like this (Cannibal Books, 2008). George Strait to playing jazz and experimental in the NYC downtown scene to attentions from Bang On A Can. Though he maintains a profile as a modern guitarist, he is most recently best known for his performances as a player of the Rubberbandhorn and the subject of a soon to be released documentary, A Rubberband is an Unlikely Instrument. Jim Behrle is the author of She’s My Best Friend (Pressed Wafer), City Point (Pressed Wafer) and The (Purple) Notebook of the Lake (Braincase). He sleeps on a floor in Greenpoint. Brenda Iijima is the author of Animate, Inanimate Aims (Litmus Press) and Around Sea (O Books). If Not Metamorphic was runner up for the Sawtooth Prize and will be published by Ahsahta Press. She is the editor of Portable Press at Yo-Yo Labs (yoyolabs.com/). Together with Evelyn Reilly she is editing a collection of essays by poets concerning poetry and ecological ethics titled, )((eco (lang)(uage(reader). She is the art editor for Boog City as well as a visual artist. She lives in Brooklyn, New York where she designs and constructs homeopathic gardens. Dorothea Lasky was born in St. Louis in 1978. Her first book of poems, AWE, was published in the fall of 2007 from Wave Books. Her poems have appeared in Boston Review, Phoebe, 6x6, Crowd, Coconut, jubilat, Lungfull!, Knock, Carve, Foursquare, and Skein, among other places. She has been educated at the University of Massachusetts-Amherst, Harvard University, and Washington University. Currently, she lives in Philadelphia, where she studies education at the University of Pennsylvania. Tim Peterson is the author of Since I Moved In, which received the Gil Ott Award from Chax Press. He edits EOAGH: A Journal of the Arts and curates a portion of the Segue Reading Series. Thibault Raoult was a Dolin Scholar at the University of Chicago, and, for two years, OFF(icial) poet-in-residence at Brown University. 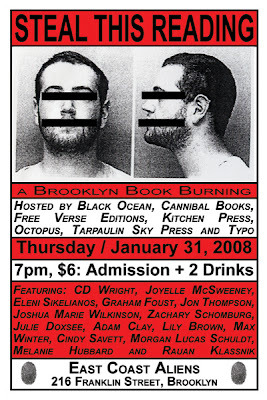 I’ll Say I’m Only Visiting emerged from Cannibal Books (Brooklyn) in Nov/07; a second run is expected in coming-season. A new volume, El p.e. [physical education of the elevated train, emerges from Projective Industries in the coming months. Born in Pithiviers, France, raised in Rochester, NY, Thibault generates the dreams [of the congregation of details—a most real e-(s)tat(e) near 3Coasts. Craig Morgan Teicher's first book is Brenda Is in the Room and Other Poems. His second, Cradle Book, a collection of fables, will be out from BOA Editions in 2010. He lives in Brooklyn with his wife and son. Dara Wier's books include Remnants of Hannah (Wave Books 2006); Reverse Rapture (Verse Press 2005); Hat on a Pond (Verse Press, 2002) and Voyages in English (Carnegie Mellon U. Press, 2001). A limited edition, (X in Fix), a selection of 5 longer poems, including a section from Reverse Rapture, is printed in RainTaxi’s Brainstorm series. She works as a member of the poetry faculty and director of the MFA program for poets and writers at the University of Massachusetts Amherst. Her book, Reverse Rapture has been recently awarded The Poetry Center & American Poetry Archives 2006 book of the year prize. Farrah Field’s first book of poems, Rising is forthcoming in early 2009 by Four Way Books. Her poems have appeared in the Mississippi Review, Margie, Chelsea, The Massachusetts Review, Harpur Palate, Pool, Sojourn, The Cranky Review, and are forthcoming in Cranky, Pebble Lake Review, Another Chicago Magazine and Fulcrum. She lives in Brooklyn. Michael Schiavo’s poetry and nonfiction has appeared in The Yale Review, Tin House, The Believer, Forklift, Ohio, The Hat, Unpleasant Event Schedule, and elsewhere. He is a contributing editor to CUE and currently resides in North Bennington, Vermont. You can visit his blog which he occasionally posts to at http://michaelschiavo.blogspot.com. Jared White grew up near Boston and is currently living in Brooklyn, New York. His poems have appeared in such journals as Barrow Street, Fugue, Harp and Altar, The Modern Review and Sawbuck; they are forthcoming in Fulcrum, Horse Less Review, LVNG and elsewhere. He’s about to finish his MFA at Columbia University, where he received a prize from the Academy of American Poets in 2005. He blogs from time to time about poems and culture at jaredswhite.blogspot.com. Laura Goode was raised outside Minneapolis, Minnesota, and counts Midwesternness among her finest traits. She received her B.A. from Columbia University in 2006, and will, barring catastrophe, receive her M.F.A. from the same university this spring. 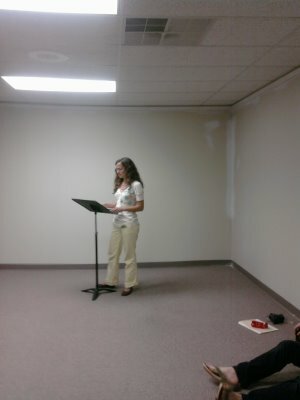 She recently served on the committee to select the first poet laureate of Minnesota. Her favorite dress was made by Hmong artisans in the Twin Cities, and it is green. Kristi Maxwell currently lives and writes in Cincinnati. She is the author of Realm Sixty-Four (Ahsahta Press, 2008), Elsewhere & Wise (Dancing Girl Press, forthcoming in 2008), and Hush Sessions (Saturnalia Books, forthcoming in 2009). 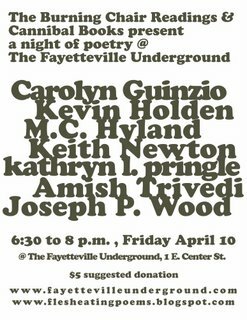 Her individual poems have most recently appeared, or will very soon appear, in Practice: New Writing & Art and Forklift, Ohio. Kate Schapira lives in Providence, RI, where she organizes the Publicly Complex reading series, featuring innovative work by soon-to-be-famous writers. She’s the author of two chapbooks, Phoenix Memory (horse less press) and The Saint’s Notebook (forthcoming from the CAB/NET Chapbook Series). She’s taught poetry workshops to incarcerated women, middle-school students, college students and first-graders, and is proud of recent acceptances to and appearances in A Sing Economy (an anthology from Flim Forum Press), Denver Quarterly, Cannibal, Word for/Word and Practice. All events are free and good for the unattended corners of your being. Events at East Coast Aliens, Jimmy's No. 43 Stage & Unnameable Books shall be shouted about soon. btwn. Flatbush & 5th Aves. A native of Jones County, Miss., Buck Downs lives and works in Washington, DC. Recent books include Ladies Love Outlaws and Recreational Vehicle. Corrine Fitzpatrick is the author of two chapbooks - Zamboangueña (Sona Books, 2007) and On Melody Dispatch (Goodbye Better, 2007). She's working on a new set of poems called Minor Crimes and Casualties, and will have other poems out in vehicular number one, a new split-side series from press gang. Greg Fuchs is the author of several books, including most recently Metropolitan Transit (isabel lettres) & Bored of Education (Rock Heals). He is columnist-at-large for Boog City and with John Coletti co-edits Open 24 Hours Press. His photographs and writing are available online at gregfuchs.com. Pierre Joris is a poet, translator, essayist & anthologist who left Luxembourg at 19 and has since lived in France, England, Algeria & the United States. He has published over forty books, with, forthcoming in 2008, Aljibar II (poems, a bilingual edition with French translations by Eric Sarner) and Justifying the Margins: Essays 1990-2006 (SALT Publishing). His 2007 publications include the CD Routes, not Roots (with Munir Beken, oud; Mike Bisio, bass; Ben Chadabe, percussion; & Mitch Elrod, guitar) issued by Ta’wil Productions; Aljibar (with French translations by Eric Sarner, published in Luxembourg by Editions PHI) and Meditations on the Stations of Mansour Al-Hallaj 1-21(Anchorite Press, Albany). Recent translations include Paul Celan: Selections, and Lightduress by Paul Celan, which received the 2005 PEN Poetry Translation Award. With Jerome Rothenberg he edited the award-winning anthologies Poems for the Millennium (volumes I & II) and most recently, Pablo Picasso, The Burial of the Count of Orgaz & Other Poems. He is Professor for poetry and poetics at the University of Albany, State University of New York. Check out his website & his Nomadics blog. Dan Machlin’s first full-length collection of poems Dear Body: was published by Ugly Duckling Presse in Fall 2007. He is also the author of several previous chapbooks: 6x7, This Side Facing You, In Rem; and an audio-CD collaboration with Singer/Cellist Serena Jost, Above Islands. His poems and reviews have recently appeared in/on Critiphoria.org, Crayon, Turntable & Blue Light, and A Portable Boog Reader 2. He is the founding editor of Futurepoem books. require you to send an attachment, please query first). immediately when the work has been accepted elsewhere. hosted by Black Ocean, Cannibal Books, Free Verse Editions, Kitchen Press, Octopus, Tarpaulin Sky Press & Typo. Lily Brown is from the east coast but currently lives on the west coast. She is the author of the chapbook, The Renaissance Sheet, published by Octopus Books in 2007. Her second chapbook, Old with You, is forthcoming from Kitchen Press. Poems have appeared or are forthcoming in Typo, Octopus, Fence, Tarpaulin Sky, Cannibal, Handsome and 26. Julie Doxsee was born in London, Ontario. Her poems have appeared in over thirty-five national and international journals, including Aufgabe, Fourteen Hills, and Tarpaulin Sky. Forthcoming publications include two books: Objects for a Fog Death (Black Ocean, 2008/2009) and Undersleep (Octopus Books 2008), and two chapbooks: You Will Build a City Out of Rags (Whole Coconut 2007) and New Body a Seafloor Body (Seeing Eye Books 2008). The Knife-Grasses (Octopus Books), and Fog Quartets (horse less press) are now available. She is full-time faculty at Koç University in Istanbul, Turkey. Graham Foust lives in Oakland, California with his wife Amy and his son Merle. He teaches writing and literature at Saint Mary's College of California, and his most recent book is Necessary Stranger (Flood Editions, 2007). Rauan Klassnik was born in Johannesburg, South Africa. In his early teens he moved to Dallas, Texas with his family. Much of his time is now spent in Mexico. His poems have appeared in Caesura, Hunger Mountain, Pilot Poetry, No Tell Motel, The Kennesaw Review, Front Porch, The Mississippi Review, The North American Review, MiPoesias, Handsome, and many other journals. His chapbook, "Stitches" was published by Firewheel Editions in 2002 and his first full-length collection, Holy Land, will be released by Black Ocean in the spring of 2008. Melanie Hubbard lives in Ruskin, FL, with her family. Recently the recipient of an NEH fellowship, she has spent the past year completing a scholarly book on Emily Dickinson's poems in relation to developments in philosophy and linguistic theory, the invention of photography and the discovery of electricity, and changes in rhetoric, editorial theory, and popular manuscript activity. She also writes personal essays, commentaries, book reviews, and features for the St. Petersburg Times. Poems can be found in Typo, Swink, Fence, Cab/Net, horse less review, and Cannibal. Joyelle McSweeney is the author of Nylund, The Sarcographer (Tarpaulin Sky Press, 2007). 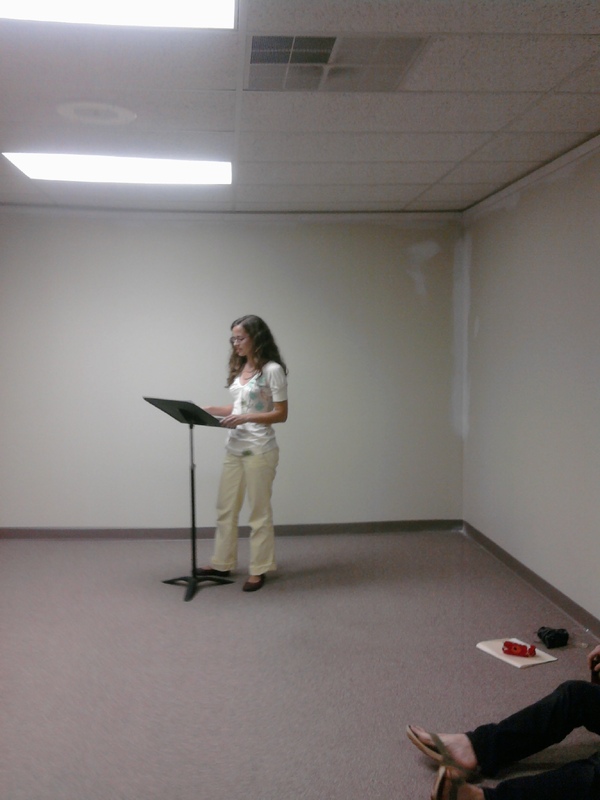 She is also the author of three titles from Fence Books: Flet, The Red Bird, and The Commandrine and Other Poems. She is a co-founder and co-editor of Action Books and Action, Yes, a press and web quarterly for international writing and hybrid forms. She writes regular reviews for Rain Taxi, The Constant Critic, and other venues and teaches in the MFA Program at Notre Dame. Cindy Savett teaches poetry workshops at psychiatric institutions in the Philadelphia area to both acute short-term and residential patients. Her first book, Child in the Road, has recently been released. In addition, she is published in numerous print and on-line journals, including Margie, Heliotrope, LIT, The Marlboro Review, 26 Magazine, Cutbank, and Free Verse. She is also at work on a memoir on the death of her daughter. Cindy has served on several school Boards and other non-profit agencies, and spent fifteen years in the retail business, traveling extensively overseas. Born and raised in the Philadelphia area, she currently lives in Merion, Pennsylvania with her husband and children. Eleni Sikelianos is the author of six books, including The California Poem and The Book of Jon. Du Soleil, de l’histoire, de la vision, a selected poems translated into French appeared this fall. Forthcoming are Body Clock and her translation of Jacques Roubaud’s Exchanges de la lumière. Zachary Schomburg was born in Omaha, Nebraska, spent his childhood in Iowa, and received his BA from College of the Ozarks. Currently, he's pursuing a doctorate in creative writing from the University of Nebraska. Schomburg edits Octopus Magazine and Octopus Books, and co-curates the Clean Part Reading Series in Lincoln, NE. His poems have appeared in the Canary, CutBank, Diagram, Ducky, Fence, Forklift, Ohio, Good Foot, the Hat, La Petite Zine, Lamination Colony, LIT, Mid-American Review, Mipoesias, No Tell Motel, Northwest Review, Parakeet, Pettycoat Relaxer, Spork, Swink, Tarpaulin Sky, Unpleasant Event Schedule, and Washington Square Review. His debut collection, The Man Suit, was published Black Ocean in 2007. Morgan Lucas Schuldt is the author of Verge (Free Verse Editions, 2007) and Otherhow (Kitchen Press, 2007), a chapbook. He lives in Tucson where he edits the literary journal CUE and the chapbook series CUE Editions. Jon Thompson teaches at North Carolina State University where he edits Free Verse: A Journal of Contemporary Poetry & Poetics and the new poetry series, Free Verse Editions. His first collection was The Book of the Floating World, which was reissued in a new expanded edition in 2007. His current poetry manuscript is titled Strange Country. Joshua Marie Wilkinson is the co-author, with Noah Eli Gordon, of Figures for a Darkroom Voice (Tarpaulin Sky Press, 2007). He is also the author of Suspension of a Secret in Abandoned Rooms (Pinball, 2005), Lug Your Careless Body out of the Careful Dusk (U of Iowa, 2006), and The Book of Whispering in the Projection Booth (forthcoming from Tupelo Press). He holds a PhD from University of Denver and lives in Chicago where he teaches at Loyola University. His first film, Made a Machine by Describing the Landscape, is due out in 2008. Max Winter is the author of The Pictures (Tarpaulin Sky Press, 2007). He is also the winner of the Fifth Annual Boston Review Poetry Contest, and has published poems in Free Verse, New American Writing, Ploughshares, The Paris Review, Colorado Review, The Canary, Denver Quarterly, and Typo. He has published reviews in The New York Times, The Washington Post, The San Francisco Chronicle, Newsday, and BOMB, and is a Poetry Editor of Fence. C.D. Wright was born and raised in the Ozark Mountains of Arkansas. She is the author of a dozen books. Her most recent titles are One Big Self: An Investigation (Copper Canyon, 2007), Like Something Flying Backwards, New and Selected (Bloodaxe Editions, 2007), Cooling Time: An American Poetry Vigil (Copper Canyon, 2005). Rising, Falling, Hovering will be out in 2008, also from Copper Canyon Press. She is a recipient of fellowships from the Guggenheim Foundation and National Endowment for the Arts, and awards from the Foundation for Contemporary Arts and the Lannan Foundation. Steal Away: Selected and New Poems was a finalist for the 2003 Griffin Poetry Prize. In 2004 she was named a MacArthur Fellow. In 2005 she was given the Robert Creeley Award and elected to membership in the American Academy of Arts and Sciences. Wright is the Israel J. Kapstein Professor of English at Brown University. She lives outside of Providence with her husband, poet Forrest Gander. Take the upper level of the Queensborough Bridge into Queens & turn left on 21st Street. Cross the Pulaski Bridge, which turns into McGuiness Boulevard on the Brooklyn side. Take the third right after the bridge at Huron St. After two blocks turn right on Franklin St. East Coast Aliens is on the right side. The ride from Midtown (w/ gratuity) should cost between $20-25. Take the Williamsburg Bridge to the BQE (Brooklyn-Queens Expressway) north to McGuiness Boulevard (Exit 33). Turn left onto McGuiness Boulevard. After approximately eight blocks turn left on Greenpoint Avenue. After three blocks turn right on Franklin Street. East Coast Aliens is four blocks up on the right side. The ride from Lower Manhattan (w/ gratuity) should range between $20-25. Take the Queens-bound 7 train from Times Square, Bryant Park or Grand Central to Vernon/Jackson (the first stop after Grand Central). Exit at Jackson Ave. & walk one block east to the B61 bus stop at 11th St and Jackson Ave. Take the B61 two stops to Manhattan Ave. between Freeman and Green. Walk right on Green St. one block to Franklin St. & turn left. East Coast Aliens is on your left. Take the Brooklyn-bound L train to Lorimer. Transfer at the station to the Metropolitan stop of the G train. Take the Queens-bound G train two stops to Greenpoint Ave. Exit at India St. & walk one block north to Huron St. Turn left on Huron, walk one block to Franklin St. & turn right. East Coast Aliens is on your right. Take the G train to Greenpoint Ave. Exit at India St. & head north one block to Huron St. Turn left on Huron, walk one block to Franklin St. & turn right. East Coast Aliens is on your right. btwn. 2nd & 3rd Aves. 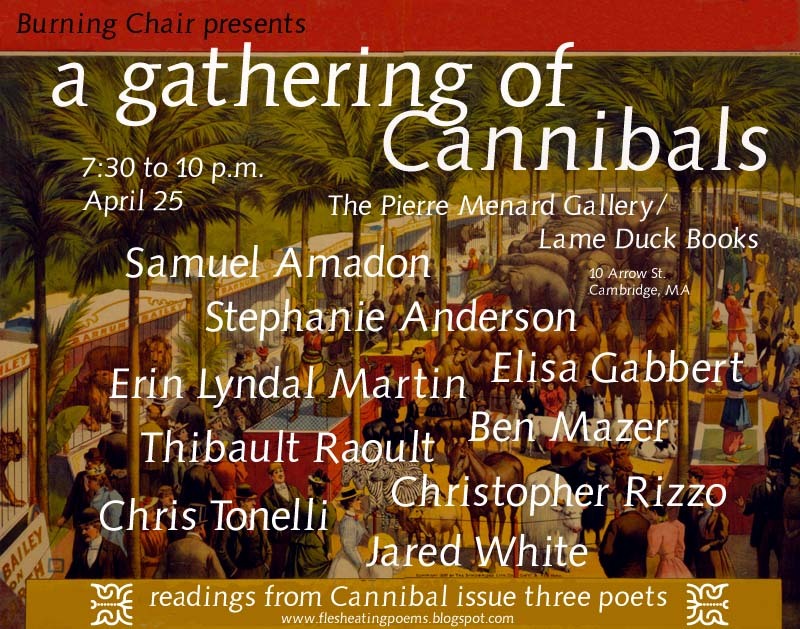 Cannibal & Cannibal Books will be on hand at the reading, as well as at our AWP table, at discounted prices. Phil Cordelli lives in New York City where he has been strictly obeying the alternate-side parking restrictions. He is also an editor at Ugly Duckling Presse. His poetry can be found in a bunch of places, but mostly his apartment. Jeff Encke, author of Most Wanted: A Gamble in Verse, has published poems in Barrow Street, Black Warrior Review, Colorado Review, Fence, Octopus, Tarpaulin Sky, Typo, and elsewhere. He received a Templeton Lectureship in 2001 through Columbia University’s Program in Narrative Medicine, where he taught literature and creative writing while completing his doctorate in English. He now lives in Seattle. Andrew Hughes divides his time between NYC and Vermont. His work has appeared or is forthcoming in Forklift, Ohio; Cannibal; Spell; Octopus; Can We Have Our Ball Back; and others. Ben Mazer is the author of The Foundations of Poetry Mathematics (Cannibal Books) Johanna Poems (Cy Gist Press) and White Cities (Barbara Matteau Editions). He is the editor of Landis Everson’s Everything Preserved: Poems 1955-2005 (Graywolf) and The Complete Poems of John Crowe Ransom (forthcoming from Handsel/Norton). He is a contributing editor to Fulcrum. Bronwen Tate is the author of Souvenirs (Dusie Chapbook Kollektiv, 2007). She received an MFA from Brown University and is currently pursuing a PhD in Comparative Literature at Stanford University, where she also edits Mantis: A Journal of Poetry, Criticism, and Translation. Recent poems have appeared or are forthcoming in LIT, CapGun, Foursquare, The Cultural Society, and Octopus. Hosted by The Burning Chair Readings & Cannibal Books. BYOB. We will bring some, too. Maureen Alsop’s recent poems have appeared or are pending in various publications including: Barrow Street, Typo, Margie, Columbia : A Journal of Literature and Art and Texas Review. Her poetry was three times nominated for the Pushcart Prize. She is the 2006 recipient of Harpur Palate's Milton Kessler Memorial Prize for Poetry and The Eleventh Muse 2006 poetry prize. Her first full collection of poetry Apparition Wren is available through Main Street Rag. ~ Two poems in Typo 10. Jean Valentine won the Yale Younger Poets Award for her first book, Dream Barker, in 1965. Her most recent collection, Door in the Mountain: New and Collected Poems 1965 - 2003, won the 2004 National Book Award for Poetry. Author of eight additional books, Valentine has received a Guggenheim Fellowship and awards from the NEA, The Bunting Institute, The Rockefeller Foundation, The New York Council for the Arts, and The New York Foundation for the Arts, as well as the Maurice English Prize, the Teasdale Poetry Prize, and The Poetry Society of America's Shelley Memorial Prize. She has taught at Columbia, Sarah Lawrence College, NYU, and the 92nd St. Y, among other places. ~ Jean Valentine.com featuring audio recordings of poems from Door in the Mountain. Paige Ackerson-Kiely was born in October of 1975 at the behest of her parents in Biddeford, Maine. Her first book, In No One's Land won the 2006 Sawtooth Poetry Prize. She currently resides in Vermont, where she is employed selling wine, and is at work on a second manuscript of poems entitled My Love is a Dead Arctic Explorer, and a novel about infanticide. Lily Brown holds an MFA from Saint Mary's College and currently lives in San Francisco. Her poems have been published or are forthcoming in Typo, Octopus, Fence, Cannibal, Tarpaulin Sky, Handsome and Coconut. Octopus Books published her chapbook, The Renaissance Sheet, in early 2007. Elizabeth Robinson is the author of 8 books of poetry, most recently Under That Silky Roof (Burning Deck Press) and Apostrophe (Apogee Press). The Orphan and its Relations is forthcoming from Fence Books in 2008. Robinson co-edits EtherDome Press and Instance Books and lives in Boulder, Colorado. Refreshments served, but you may also BYOB. Kitchen Press and Cannibal Books products will be available for consumption. Unnameable Books carries an excellent selection of poetry from independent presses. Joseph Bradshaw was born in Caldwell, Idaho, and grew up up and down the west coast. From 2002 to 2006 he co-edited FO(A)RM Magazine and co-curated the Spare Room reading series in Portland. A chapbook, The Way Birds Become, was recently published by Weather Press. His poetry and reviews can be found in current or forthcoming issues of Cannibal, Cultural Society, Denver Quarterly, Jacket, Mirage #4 / Period(ical), and elsewhere. He currently lives in Iowa City, that hotbed of literary puke. Ken Rumble is the author of Key Bridge (Carolina Wren Press, 2007) and marketing director of the Green Hill Center for North Carolina Art. He is currently working on a book with his father about the earth's atmosphere & Antarctica. His poems have been published in Parakeet, Cutbank, Fascicle, Typo, Octopus, XConnect, Coconut, and others. Dorothea Lasky was born in St. Louis, MO in 1978. Her first full-length collection, AWE (Wave Books), will be out in the fall of 2007. She is the author of three chapbooks: The Hatmaker's Wife (Braincase Press, 2006), Art (H_NGM_N Press, 2005), and Alphabets and Portraits (Anchorite Press, 2004). Her poems have appeared in jubilat, Crowd, 6x6, Boston Review, Delmar, Phoebe, Filter, Knock, Drill, Lungfull!, and Carve, among others. Currently, she lives in Philadelphia, where studies education at the University of Pennsylvania and co-edits the Katalanche Press chapbook series, along with the poet Michael Carr. She is a graduate of the MFA program for Poets and Writers at the University of Massachusetts-Amherst and also has been educated at Harvard University and Washington University. Laura Solomon was born in 1976 and grew up in the deep South. She studied Political Science and Literature at the University of Georgia in Athens, and later Creative Writing at the University of Massachusetts-Amherst. Her first book Bivouac was published by Slope Editions in 2002. Other publications include a chapbook, Letters by which Sisters Will Know Brothers (Katalanché Press 2005), and Haiku des Pierres / Haiku of Stones by Jaques Poullaouec, a translation from the French with Sika Fakambi (Apogée Press, 2006). Her second book of poetry Blue and Red Things has just been released by Ugly Duckling Presse. Currently she lives in Philadelphia where she works as a tutor and researcher for an adult literacy intervention program. David B. Goldstein is the author of a chapbook, Been Raw Diction (Dusie), and his poetry has appeared in numerous journals, including The Paris Review, Jubilat, Typo, Epoch, Alice Blue Review, and Pinstripe Fedora. He recently joined the faculty of York University in Toronto, where he teaches Renaissance literature, creative writing, and food studies. Genya Turovskaya is the author of the chapbook The Tides, recently published by Octopus Books. Her poetry and translations from Russian have appeared in Conjunctions, Chicago Review, jubilat, Landfall, A Public Space and other publications. She lives in Brooklyn, and is an editor at Ugly Duckling Presse. David Shapiro’s New and Selected Poems (1965-2006) emerged from Overlook Press in 2007. In addition to his many books, Shapiro has published art criticism and poetry in The New Yorker, The Paris Review, and Artforum. He has received a fellowship from the National endowment for the Arts, the Zabel Prize for Experimental Poetry from the American Academy of Arts and Letters, and a nomination for a National Book Award in 1971. He has edited volumes of aesthetics, translated Alberti’s poems about Picasso, collaborated with Rudy Burckhardt on three films, and had a play produced at the Kitchen, co-authored with Stephen Paul Miller, called “Harrisburg Mon Amour or Two Boys on a Bus.” A professional violinist in his youth, he now writes in Riverdale, New York, where he lives with his wife Lindsay. Frank Sherlock is the author of Wounds in an Imaginary Nature Show (Night Flag Press), Spring Diet of Flowers at Night (Mooncalf Press), ISO (furniture press) and 13 (Ixnay Press). 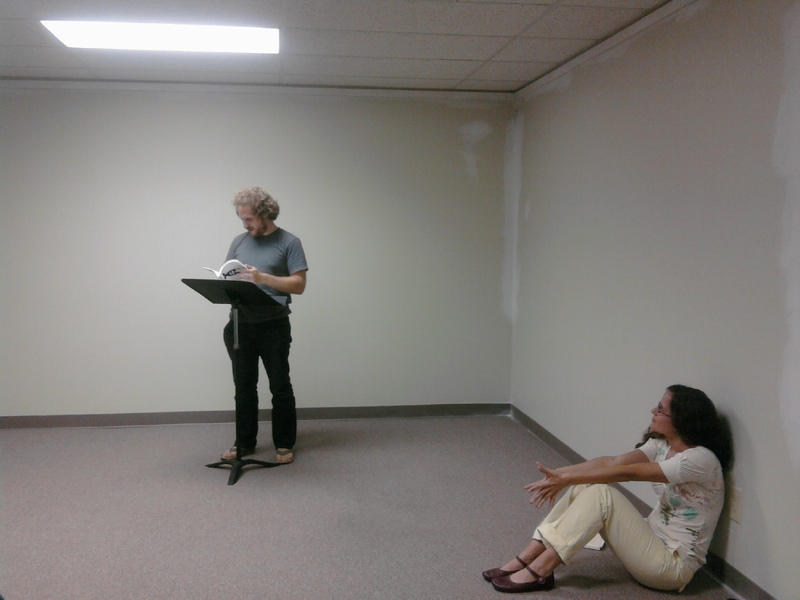 Past collaborations include work with CAConrad, Jennifer Coleman, and sound artist Alex Welsh. Publication of his most recent collaborative poem with Brett Evans, entitled Ready-to-Eat Individual is forthcoming in the near future. Dara Wier's books include Remnants of Hannah (Wave Books 2006); Reverse Rapture (Verse Press 2005); Hat on a Pond (Verse Press, 2002) and Voyages in English (Carnegie Mellon U. Press, 2001). A limited edition, (X in Fix), a selection of 5 longer poems, including a section from Reverse Rapture, is printed in RainTaxi’s Brainstorm series. Recent poems can be found in American Poetry Review, New American Writing, Volt, Massachusetts Review, The Melic, The Canary, Painted Bride Quarterly, Mississippi Review, slope, Hollins Critic, Seattle Review, Turnrow, Hunger Mountain, Cincinnati Review, Denver Quarterly, Octopus, Conduit, Crazyhorse, Court Green and Gulf Coast. She works as a member of the poetry faculty and director of the MFA program for poets and writers at the University of Massachusetts Amherst. Her book, Reverse Rapture has been recently awarded The Poetry Center & American Poetry Archives 2006 book of the year prize. - "Blue Oxen"
editor at Ugly Duckling Presse. - "Pax"
Graham Foust. Necessary Stranger. Flood Editions: 2006. “Sob Poem” begins with a confessional: “Grief that we should be like this./I don’t hate you, broken gift.” The lines neither hide behind irony nor offer cathartic compensation. 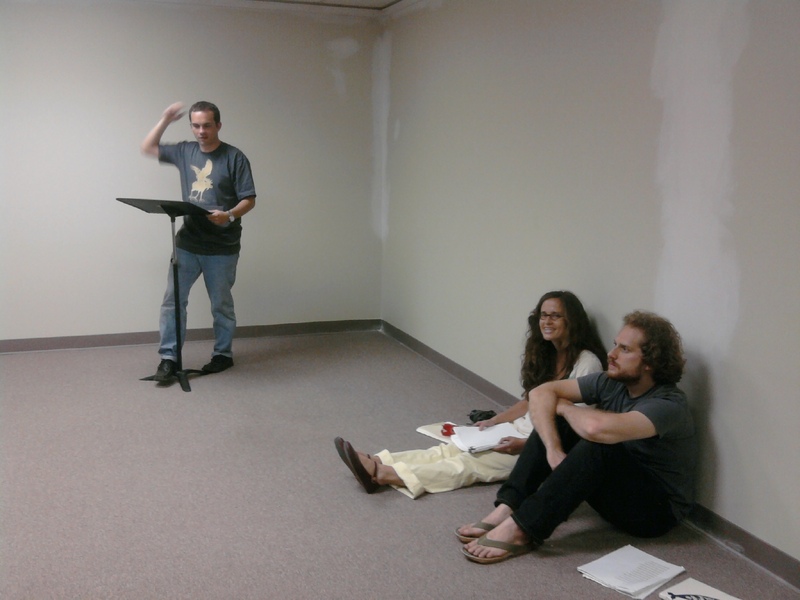 Though after emotional clarity, Foust is not afraid to embrace phrases with expressionist leanings. The obscurity of “Starting-to-cry’s a wire from/the mind to nowhere” results from an attempt to identify the tenuous and virtually unnamable bridge between sensory and emotive experience. In “Panama,” Foust begins with one of Stevens’ favorite tropes: “Fruit thumps in the pointless/grass, has no hand in itself.” Foust, unlike Stevens, does not use the sensuality of the apple as a critique of religion but as an observed phenomenon elucidating the predicament of recognizing the possibility of one’s own meaninglessness. Turning the expected “could” into “couldn’t,” Foust admits that what he knows necessitates doubt far more readily than what he doesn’t know allows for faith. Although it’s not a defense of religion, “some sarcastic new Christ” critiques the abundant abuse of irony and the resulting emptiness of “some” (as opposed to Foust’s literal application of “nowhere”). Foust continually identifies suffering as the basis of experiential investigation (“Pain is okay—/it’s the practical/that murders”). Our “practical” ideologies and self-defenses inhibit our capacities for experience. He also says, “Our city’s a list/of its pissed-//out-of windows.” Instead of synthesizing the blossoming and the piss, nearing the end of the poems Foust reverts to symbolic purity: “You break into belief./I lie and climb into tears.” I’ll take a few bleary lines like that, though, over a book pat with ironic and imagistic evasions. Most of my favorite books read like that. Our Fall line up is coming soon.